Hey guys! I know it's been forever since I last uploaded a tutorial - I actually filmed this ages ago, but only just found the time to do the voiceover and finally publish. I was at a photoshoot a while ago and saw a makeup look similar to this one on one of the models, and instantly loved it. 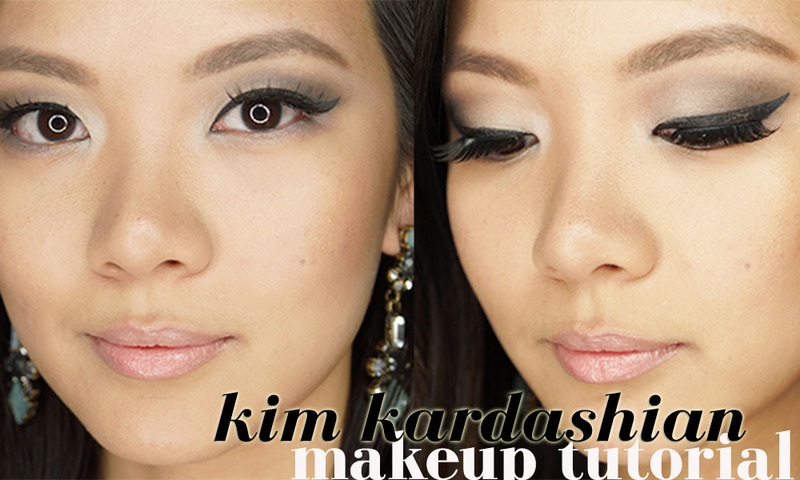 Once I tried it on myself, I realised how similar it is to the makeup that Kim Kardashian normally wears, hence the title of the tutorial. Napoleon Perdis Autopilot Primer - a great primer for nighttime as it keeps your makeup in place and makes your skin look glowing and radiant. It also smooths out the skin, which helps the foundation glide into place. I wouldn't recommend this for humid weather though, but for any other kind of weather, this is a beautiful primer. Make Up For Ever HD Foundation - this has made its way into my list of favourite foundations. It gives pretty good coverage without being too cakey on the skin, and seems to sit just right once you buff it in. Remember to thumbs up the video or just leave a comment below if you want to see a HD makeup tutorial! MAC Paint Pot in Painterly - this is one of those eyeshadow bases that are perfect for almost any look. It lightens the lid colour just the right amount, and provides the perfect base for eyeshadow to stick to. bh cosmetics 120 Colour Palette - a great palette if you don't play with colours too often. It has decent pigmentation and blends easily. Plus, it's really affordable! Clinique Brush on Cream Liner - my favourite gel eyeliner. It's lasted me forever and hardly moves once applied. Plus point - it doesn't dry out fast like some other brands. Shiseido Natural Cream Concealer - this is a great, pigmented concealer. I use it for both my undereye area as well as on spots around my face, and haven't experienced many issues with it creasing, especially after I set it with a loose powder. You only need a tiny bit of it, and the finish is - true to its name - natural. Sleek Contour Kit in Medium - you guys are probably sick of hearing me mention this product! It really is a great colour and texture for an affordable price though. There are loads of Sleek parallel importers and resellers online, so Google them to find one that ships to you. TheBalm Mary Lou-Manizer - my favourite highlighter. Read about it here.